When it comes to buying new cars, my husband and I are not ones to upgrade very five years. We like to find a car and stick with it. That is what we had planned when we bought a used Honda Civic a year and a half ago. However, we did not plan for any additional family members to be joining us. Nevertheless, we were looking to upgrade our 2-door Honda Civic into something more family friendly, which brought us to the search of SUVs. If you have ever been in the market for an SUV, you may have noticed that they are pretty pricey. It seems as if there is no such thing as a base line model when you go to the dealership because every dealer likes to amp up the SUVs with all the extra bells and whistles. We finally decided on a new Kia Sorento because it seems that many used SUVs have or have the potential for electrical problems if they are older than 2008. If you look up several SUVs on ConsumerReports.org, you may even notice that majority of SUVs have had major redesigns in the past few years. I am going to take a guess and say that these two facts are related. 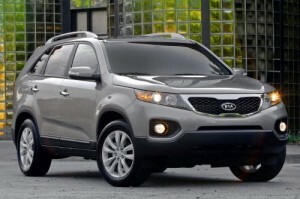 There is much to love about the 2013 Kia Sorento. We were able to get as close to the base model as possible, though our model included some wonderful “standard” things such as a back up camera, Bluetooth integration, seat warmers, odor-proof and water-proof seats, and other nice features. Usually these features cost a lot more on other SUVS. Another thing to love about the Kia Sorento is the amazingly long warranty it comes with. We opted for the extra 100,000 mile warranty. It is a great idea if you are looking for a car to keep around for a long time. 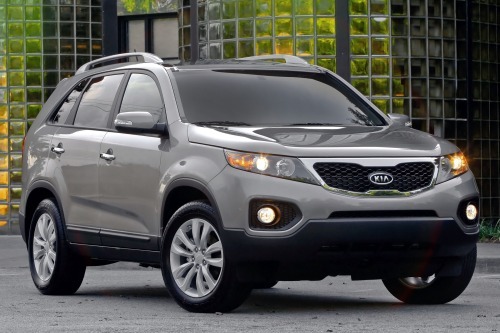 As far as driving goes, the Kia Sorento drives like a car. It drives smoothly and is very comfortable. It also gets similar gas mileage as a car. It averages about 23-24 MPG for equal highway and city use. The car also keeps track of your MPG for you too, letting you know when your speed is in the perfect gas saving mode and when it is not. If you are in the market for a new SUV this year, I cannot recommend the Kia Sorento enough. Not only does it cost less than several of the competing SUVs, but it also helps you save money in the long run with its cool features. Another car that was on our short list was the new Honda cr-v 2013. For 2013, the Honda CR-V keeps pace with the market in terms of connectivity, and it includes a well-rounded feature set; the only caution, for those who like to add some extras like a navigation system or satellite radio, is that to get them you may have to move all the way up to the much more expensive EX-L model. There, you do get a few upgraded interior trims, plus leather upholstery, a ten-way driver’s seat, heated front seats, automatic climate control, heated mirrors, and a higher-power (328-watt) audio system with sub woofer.